Overall the event had a positive energy about BlackBerry’s offerings. BlackBerry employees were highly motivated and enthusiastic about both their accomplishments of the past year and the future direction of BlackBerry. Basic to BlackBerry’s ongoing recovery is employee morale; it was infectious on all those attending. Having real product to work with and talk about contributed to the overall positive, upbeat environment. Meeting developer partners impressed upon me the drive and motivation that are bringing about some unique and productive applications. Most impressive was meeting Hisham Hassan Bakr, an Egyptian developer who, in the course of all the political turmoil in Egypt over the past couple of years, came up with a unique application, AIO Remote – a native app that lets you control your computer remotely from your BlackBerry® 10 device with a comprehensive set of features, (including a touch pad for my Windows 8 “Modern” operations?). He covered a lot of bases with this unique application; only time and usage will tell. But there are many more like him around the world, including Jonah Lin, representing Mmmooo.com, China’s largest mobile applications publisher, who are participating enthusiastically in the developer program. Without the enthusiasm and motivation of these tens of thousands of developers, BlackBerrry would be nowhere. Now their challenge is to create unique “must have” applications that take full advantage of BlackBerry’s developer platforms and BB10 operating system. Over the course of the event I attended several sessions; in all of them I learned valuable information about BlackBerry programs, such as Built for BlackBerry, Event Driven Processing for Applications (headless BlackBerry), how BBM can be leveraged as a marketing tool for applications and BlackBerry in healthcare. With a personal interest in healthcare processes, due to my own recent personal experiences, my previous client base that involved healthcare applications and my two sons’ involvement as medical professionals, the two healthcare sessions provided a window on how BlackBerry, and especially the features of BlackBerry 10, can be leveraged to drive efficiencies into patient care and monitoring. Suffice it to say between privacy issues and the emotional attachment to healthcare, these tools overcome many of the communications barriers and overheads inherent to healthcare processes. More in an upcoming post. Yes I did an interview on CrackBerry Live but, much more importantly, the CrackBerry team’s presence at BlackBerry Live has created a significant archive of the players and ongoing activities in the BlackBerry ecosystem. Interviews with BlackBerry executives and third party developers; commentary on BlackBerry’s announcements and more. Check it out if you want to get the real vibes that were coming out of the event. Perhaps the most significant and controversial announcement was the forthcoming availability of BlackBerry Messenger on iOS and Android devices. From my perspective, it’s not about exclusivity to one platform but rather making an application available to as broad a public as possible that bodes for success in today’s Internet-enabled world. In my own business career, I never encountered a situation where an element of exclusivity, in any form, worked in the long run. In the end it’s about building networks of friends, colleagues and partners for both synchronous and asynchronous communications across a BYOD world. Personally I feel BlackBerry needs to add BBM clients for Windows and Mac PC’s; while certainly taking on more limited roles in the Internet space, PC’s still have a role and are by no means going away. More in a future post but it will be interesting to see how this expanded access plays out in reality. It was while attending my first or second CES five or six years ago that I realized the value of BlackBerry Messenger. It was the most reliable means of instantly communicating with key colleagues in what was the very “noisy” environment and confusion of CES. Chat mutes the background noise of voice calls; over-the-top chat also overcomes the saturation of mobile voice channels. In those days BBM was a build out of PIN-to-PIN communications inherited from the days of being an enhanced pager. Its one limitation was that I only had about 50 contacts accessible but it pushed a message through on demand in the true sense of the word. Building on today’s success of BlackBerry Messenger as a chat/voice/video personal communications platform, BBM Channels introduces an innovative social networking aspect whose role will be determined by its ultimate feature set and acceptance as a “must have” user engagement channel. To date it seems to be playing out as a “back channel” where hosts can put out background or complementary information to what is being delivered across the legacy social networking channels such as WordPress and Facebook. Will the fact that over 10 billion messages are delivered daily for 51 million users, with most of them being responded to within 20 seconds, play a role in determining its uniqueness? For those who are using the beta, the Voice On The Web Channel PIN is C0004ABB2. When I was in the scientific instrumentation business, my employers had a product evolution process of creating initially a high end instrument with all the bells-and-whistles the scientific research community would request. With the experience and feedback generated through these offerings, they would then develop a line of lower end products that allowed scientists to perform the majority of the experiments for more routine clinical analysis measurements at a significantly lower cost. The BlackBerry 10 devices, Z10 and Q10, certainly represent a high end mobile computing platform with all the bells-and-whistles for supporting real time and asynchronous communications, social networking, web browsing and third party applications. On the other hand the newly announced Q5 brings the feature set of the BlackBerry 10 Operating System to a lower cost hardware device. Incorporating the Hub, the world’s fastest smartphone browser and access to BlackBerry 10 applications, the compromise comes from the processor (dual core, 1.2GHz SnapDragon), the keyboard design, 8GB internal memory, no battery access, LCD Display and a lack of external connections such as the HDMI port for viewing on any HDMI-enabled display. There is a slot for a 32GB SD card. The bottom line is that the BlackBerry Q5 brings BlackBerry 10 Operating System features on a device that should appeal to mid-range markets, not only in Latin America, Asia, Africa and eastern Europe but I expect we’ll be seeing it available later on North American and European carriers. Initially it helps to sustain BlackBerry’s presence in markets that have supported them strongly through BlackBerry’s challenges of the past two years. The major advantage of participation in this program was the opportunity to meet other BlackBerry enthusiasts and discuss their experiences, impressions and concerns. 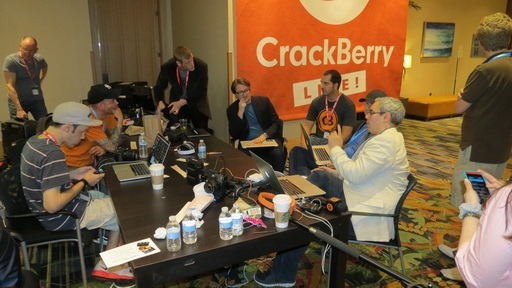 We had a couple of briefings, one of which is reported on CrackBerry Live. BlackBerry Elite provides an opportunity for frank exchanges across a demographic of developers, customers (both enterprise and consumer), bloggers and social networking activists. Hopefully these exchanges contribute to the evolution of BlackBerry offerings. 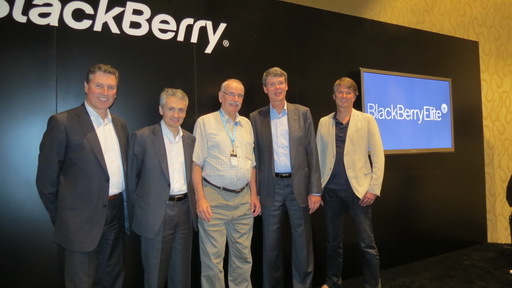 Yes, there was a photo op session following a briefing by the BlackBerry C-level executive team. As this occurred prior to the keynote, there was really no news coming out of this session. BlackBerry Live presented an opportunity to both learn and network. Meeting customers from Qatar, service provider representatives from Sweden and a developer partner from Egypt contributed to providing a better feel for the enthusiasm and acceptance of BlackBerry 10 around the world. There was also some learning about the competitive space. I saw not only examples of BlackBerry 10 on automobiles but also its implementation as a healthcare platform in communications-critical applications. While BlackBerry has achieved many accomplishments over the past years, as CEO Thorsten Heins stated a few times during the event, this is just the beginning; the challenge is the future. Getting the Q10 launched in the U.S., expanding the applications base and migrating it to native apps, supporting enterprises to (re-)adopt BlackBerry as a corporate standard and connecting to the “Internet of Things” are just a few of the many challenges ahead. And, for me, this was the first conference I had attended where my mobile device was more than a smartphone; it was all I needed for most of my conference computing activities. My BlackBerry Z10 kept me in touch with social networking activities, news reports on the conference (and the emerging political scandals back home), my Skype contacts – especially the group chats and, of course my email. Flying down to Orlando and back home, BlackBerry users could take advantage of the free Go Go Inflight WiFi offered on Delta (to June 30). 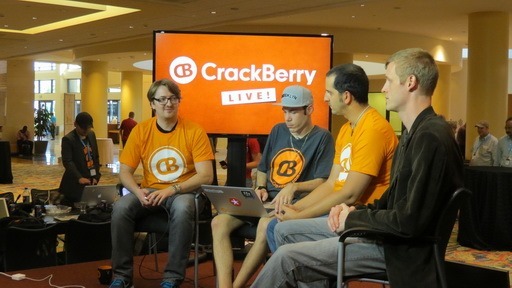 I only used my MacBook to prepare the PowerPoint presentation for the CrackBerry Live interview; I used the BlackBerry 10 to make the presentation. 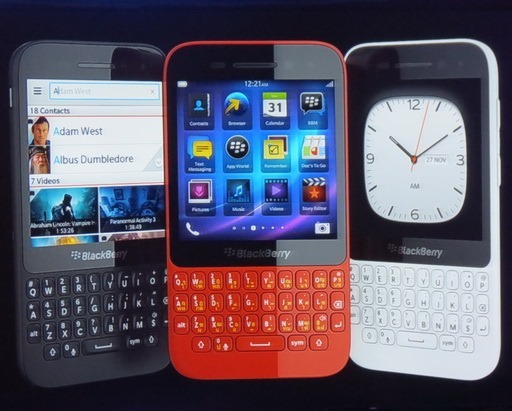 Full disclosure: The author attended BlackBerry Live 2013 as a guest of the BlackBerry Elite program. Other than a non-disclosure agreement regarding confidential information, no conditions have been placed on any coverage I may provide of the event. At the time of authoring this post, I had no proprietary information regarding BlackBerry’s future direction but rather simply my own past experience and information provided at BlackBerry Live sessions. The author has a small holding of BlackBerry shares. But he also has iOS and Android devices in order to experience a cross section of the smartphone and tablet market. These observations are based on publicly available information combined with his own past business experience at senior management levels in high technology markets. His main interest is in seeing several thousand jobs maintained in not only the Canadian economy but also in BlackBerry organizations around the world.